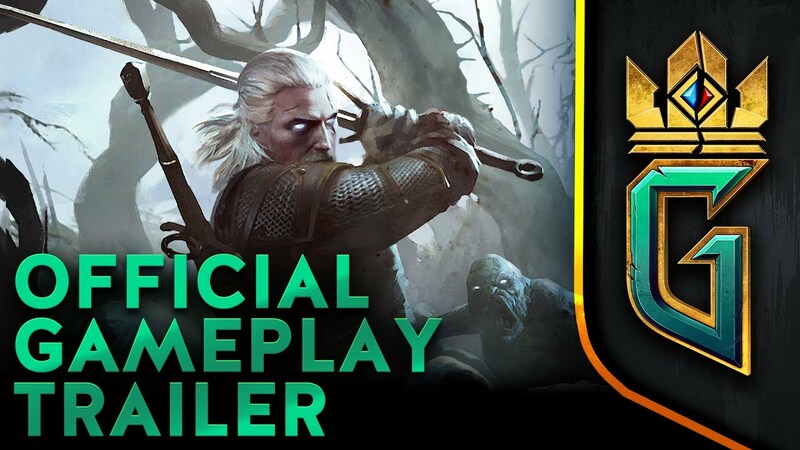 Gwent – collectible card game online (CCG) based on the popular mini-game in Witcher 3: Wild Hunt with multiple modes of play for PC, PS4 and Xbox One. You start playing with 10 cards and you have a limited number of ways to get more, so you need carefully plan behavior strategy. There are five factions (Skellige, Scoia’tael, Nilfgaard, Monster, Northern Realms) and each offers very unique playstyles and tactical possibilities. Cards can be placed in one of three rows (Siege, Melee, or Ranged). For winning players get ore, you can spend it from the local troll and buy a barrel with five new cards. The game has five modes: regular game, training with AI, rating match, tests, in which you can earn ore and leader cards and arena. Unlike other CCGs, players in Gwent can outsmart rivals by bluffing them into attacking, defending, lure opponents into traps, or sacrifice a single round in order to play better next round. A game is won when a player takes two out of three rounds. Long training hours and friendly PvP battles at the card table will lead the player to victory in rating battles.